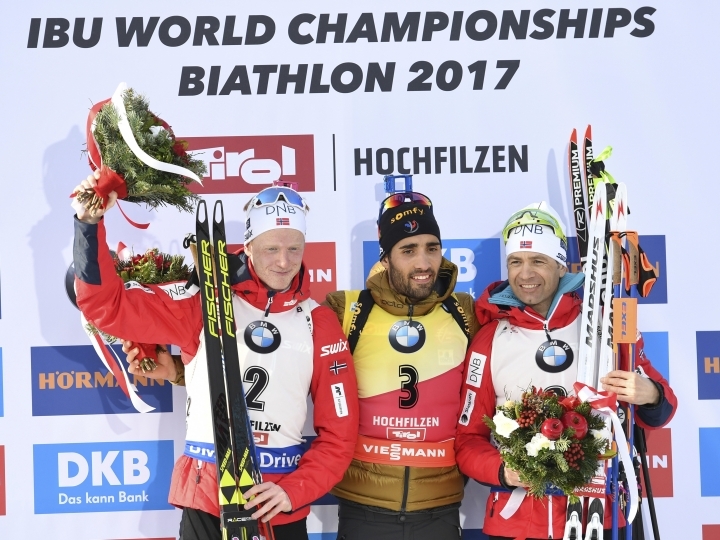 HOCHFILZEN, Austria — Martin Fourcade won the men's pursuit world title for the fourth time on Sunday, hours after Laura Dahlmeier also defended her title in the women's race. 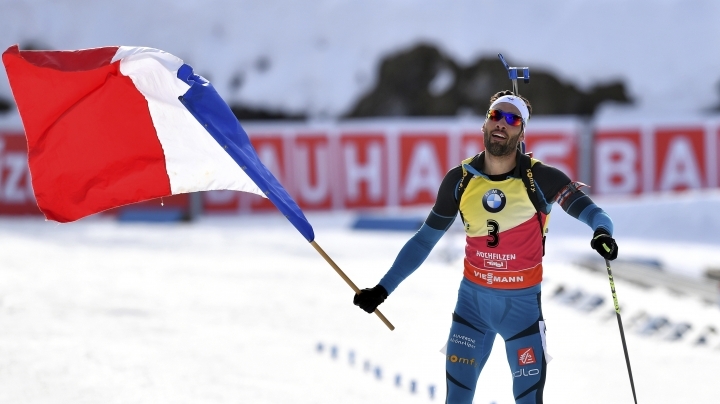 Carrying the French flag while finishing, Fourcade dominated the 12.5-kilometer race to win his 11th career gold medal. The five-time overall World Cup champion finished in 30 minutes, 16.9 seconds to beat Norwegians Johannes Thingnes Boe and Ole Einar Bjoerndalen by 20.8 and 25.6 seconds, respectively. "It's amazing that the set is now complete but there are still a few competitions coming up," said Fourcade, who earlier this week won bronze in the sprint and silver in the mixed team relay. Fourcade started third but overtook sprint gold medalist Benedikt Doll of Germany and Boe after their first visit to the shooting range. While Doll and Boe both skied a 150-meter penalty loop, Fourcade shot cleanly and went in front. His lead was big enough that even missing the final target and skiing the penalty loop did not put his victory in danger. The 43-year-old Bjoerndalen earned his 45th medal at world championships, 20 years after winning his first — bronze in the pursuit of the 1997 worlds in Slovakia. "It was a super performance from me. Unfortunately, two other guys were even better," said Bjoerndalen, whose wife, Darya Domracheva, won silver in the women's race earlier Sunday. Domracheva, the three-time Olympic champion from the Sochi Games, returned last month from a nearly two-year layoff. She sat out last season because of an illness, then got married and gave birth to their first child four months ago. "When I started to prepare for this event, I tried to believe that everything is possible," Domracheva said. The Belarusian started in 27th but was only beaten by defending champion Dahlmeier, who claimed her third medal at the biathlon world championships. 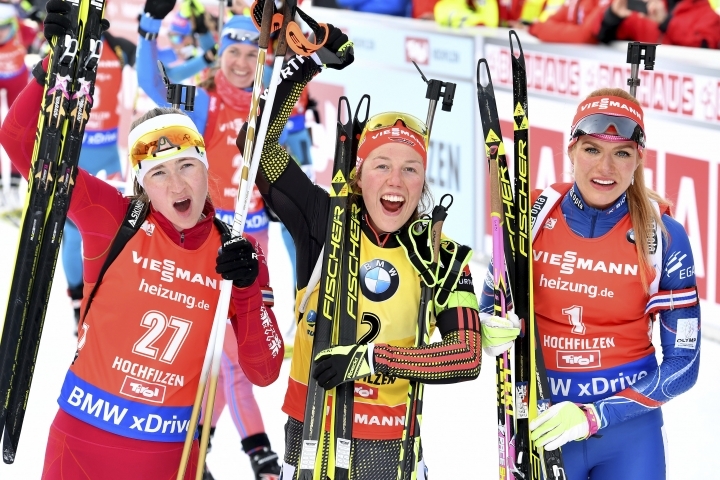 The German overall World Cup leader started four seconds behind sprint gold medalist Gabriela Koukalova but overtook her Czech rival despite missing one target in the first shooting stage. Koukalova missed twice and had to complete two penalty loops. She trailed Dahlmeier by 42.5 seconds when she left the range and couldn't make up the deficit on the track. Dahlmeier finished the 10K race in 28:02.3 seconds to lead Domracheva by 11.6 seconds. Koukalova missed three times and finished 16.6 behind to take bronze. "I managed well to stay cool," Dahlmeier said. "The early mistake was annoying but I knew every other shot had to hit the target." Earlier, Dahlmeier earned silver in the sprint and won gold with the German mixed relay team. Irina Starykh shot cleanly while she climbed from 24th to fourth. Just weeks ago, the Russian came back from a three-year doping suspension that kept her away from the Sochi Olympics. She returned by winning three gold medals, including in the pursuit discipline, at the European championships in January. The biathlon world championships continue Wednesday with the women's 15K individual competition.